I remember being a kid and perking up every time a famous explorer was discussed in school. Something about the struggle to survive and the desire to find something that no one had seen before resonated with me, as I suspect it does with a lot of people. We love exploring the unexplored which is why we still tune in every time the Mars rover finds something new or someone figures out how to explore more of the sea floor. (And why we watch copious amounts of Star Trek reruns.) Expedition: Famous Explorers taps into this instinct and the only question is: Is it a good game or are you better off getting your own backpack and heading off into the wilderness on your own adventure? 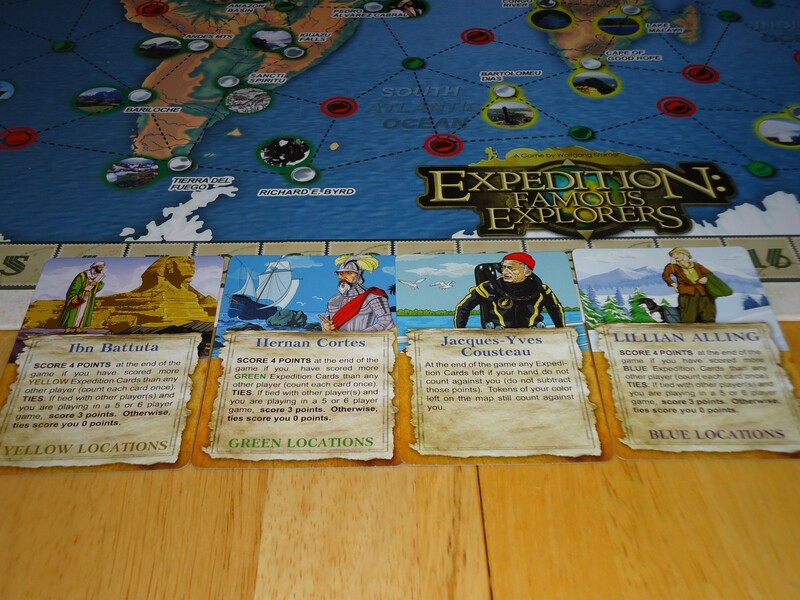 In Expedition: Famous Explorers, you are in control of several locations on the world map. 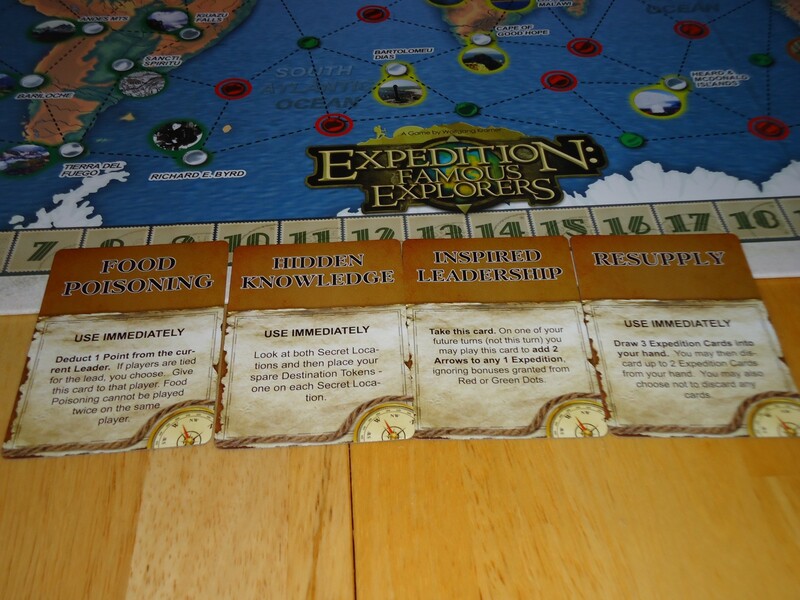 Your goal is to push the three ongoing expeditions through your locations which will score you points. But that’s not all: You also want to keep the expeditions from passing through locations controlled by your opponents so you can deprive them of said points. At the beginning of the game, you receive a hand of location cards which represent the locations that are in your control. Choose four of these locations and place your player tokens on the matching locations on the board, marking those locations as your Important Destinations. Keep the other locations in your hand secret from the group. Place six location cards face up next to the board. These are the Public Destinations which everyone can try to win. Turns are very simple. On your turn, place one arrow on the board, advancing an expedition to a new location. Arrows must be placed on the dotted lines that connect locations, they cannot double back on themselves, and they cannot continue from anywhere other than the last placed arrowhead. There are three arrow colors and each color represents a separate expedition. There can never be more than one expedition of each color and an expedition cannot change color mid-stream. If an expedition passes through a location matching one of the cards in your hand, you earn one victory point and place the matching card face up in front of you. If it passes through one of your Important Destinations (marked with your player token), you receive two victory points. An Important Destination can only be scored once, so remove your player token and place it on top of the matching card to remind yourself that it’s worth two points at the end of the game. If an expedition passes through a Public Destination, the player who placed the arrow takes the corresponding card and places it in front of herself, earning one point. Another location card is drawn to replace it so that there are always six public locations available. In addition to locations, expeditions may encounter green and red dots. The spoils of the dot go to the player who places the arrow that ends on the dot. Green dots allow you to immediately add another arrow to any of the three expeditions. A red dot gives you one ticket. Tickets may be spent to buy additional actions. (A maximum of two tickets may be spent per turn.) In the basic game, tickets can be spent to add an arrow to any expedition, remove an arrow from the end of any expedition, or discard an expedition card from your hand, draw two new cards, and choose one to discard and one to keep. Some of the location cards. 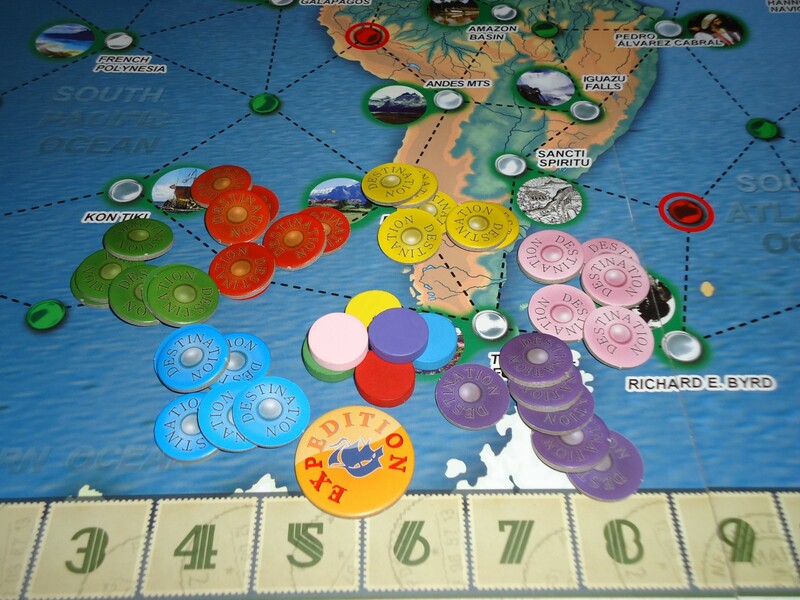 Turns continue with players placing arrows and directing expeditions until the end of the game is triggered in one of two ways. 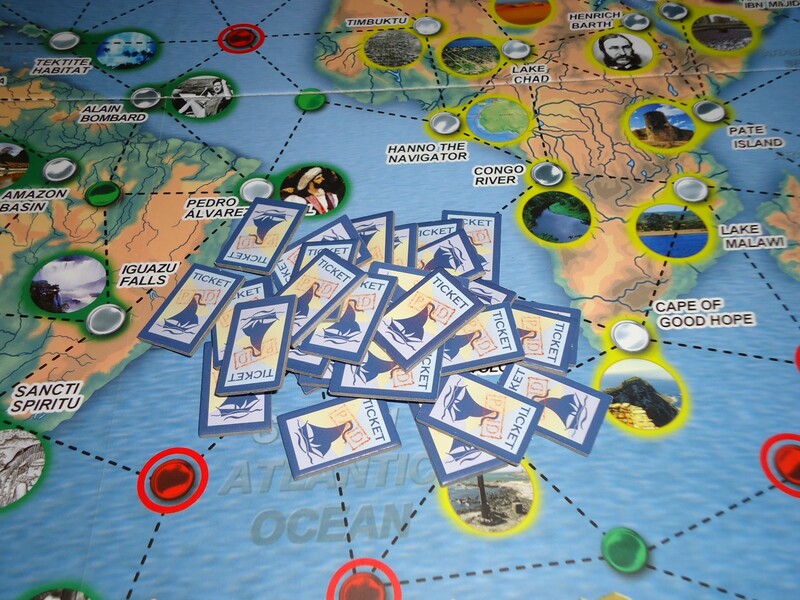 When a player scores the last expedition card in their hand, the game ends after all players have had an equal number of turns. 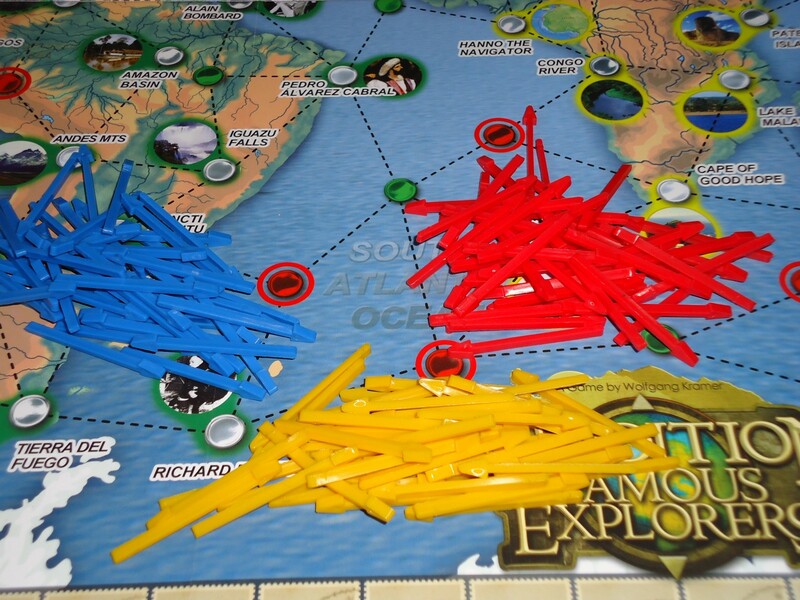 Alternatively, if all arrows from all three expeditions have been used, the game ends immediately and scoring begins. As noted above, Important Destinations are worth two victory points, while Public Destinations and all other cards scored from your hand are worth one point. You lose one point for every expedition card still in your hand at the end of the game. You also lose one point for every player token of yours that is still on the board at the end of the game (meaning you didn’t reach that Important Destination). Points are tallied and the winner is the explorer with the most points at the end of the game. Note that the description above applies only to the basic game. There are additional rules that increase the difficulty, complexity and strategy of the game. These include the addition of Explorer cards (which grant bonus points if the conditions on the card are met), Event cards (which have effects that trigger at various points in the game), and Secret Destinations (which add a memory element to the game as well as another way to earn extra points for passing locations). The basic flow of play remains the same; these extras merely provide additional considerations and point scoring opportunities. Boldly Going Where No Game Has Gone Before, or Exploring the Known Universe? Expedition: Famous Explorers is a reimplementation of Expedition (which had you searching the world for archaeological sites) and Wildlife Adventure (which had you searching the world for endangered animals). The current Expedition is basically the same game as these earlier two. The advanced rules and the new theme are really the only differences. If you own one of the earlier editions it may not be worthwhile to purchase this one, unless you like the theme better. On the other hand, if you prefer one of the earlier themes, it might be worthwhile to track one down on the secondary market. Whichever version you end up with, you’re getting a really fun game. It doesn’t look like much on the surface. When I first read the rules, I was thinking, “All I do is place an arrow? This sounds like a kid’s game.” And it is suitable for kids. It’s also a very good game for adults. While your actual movement is simple, there is a decent amount of thought that goes into making that movement. First, there are three expeditions going at once. Which one should you try to influence now because it’s closing in on a location you need, and which can wait? Or, if two are good choices for this turn, you must look ahead. If you influence an expedition now and it heads in the direction you want, how do you think that might affect future turns? What’s the likelihood that it continues to head where you need to go and what’s the likelihood that you should have put more effort into another expedition? It’s not as simple as blindly slapping down an arrow and hoping for the best. Player tokens, score markers, and first player marker. The tickets also provide some interesting choices. You can only spend a maximum of two per turn, so when is it in your favor to use those extra actions? How can you best chain your actions together for your benefit? Tickets also give your opponents a way to mess with you (and you with them). They can remove your arrow, back the expedition up to the last location, and then send it in another direction. Of course, you can do the same and it makes for an interesting strategic choice. There are also unique rules for resolving loops that further complicate your decisions. If an expedition forms a loop, the player who caused the loop immediately places another arrow of the same color branching off from any point of the loop. It can be to your benefit to cause a loop because it essentially gives you another action and a chance to send an expedition off in a more beneficial direction. While you’re considering all of this, you also want to keep an eye on where you think your opponents are heading. You won’t know all of their destinations, but you will be able to see their Important Destinations (and you can probably infer some of their others based on where they seem to be heading or which Public Destinations are on the table). You want to stop them from getting there, if you can, because scoring is a little reminiscent of Ticket to Ride, with unreached destinations and unused cards costing you points at the end of the game. Some of the Explorer cards used with the advanced rules. If this isn’t enough meat for you, the advanced rules are better for gamers and for people who have played the game a lot (or for kids who have aged up into “gamer territory”). Those rules give you more ways to earn points and alter the events of the game. The Explorer and Event cards also present more choices for what to do with your tickets, since tickets are the currency used to buy those special cards and gain their benefits. This still doesn’t make the game add up to a three hour, brain burning affair, but it does make it a more challenging puzzle. Beyond the actual gameplay, Expedition offers some other benefits, as well. First, it’s a little bit educational. The text on the cards is accurate so you can learn new things by reading cards between turns. It also helps a bit with geography skills since you have to find your locations on the map. Second, there’s a social element to the game. Expedition generates table talk and sharing as people reminisce about visits to locations or share random facts that they know. There’s also a bit of good natured moaning and celebrating as players divert expeditions in new directions. Sure, you can sit there in mute silence, but why would you want to when it’s easy to engage with your friends and family over this game. Of course, nothing is perfect and there are some tiny nitpicks with Expedition. First of all, at 90 minutes it can be a little long, especially when playing with the full complement of six players and most of them have never played before (or if you have AP prone players in the group). Yes, there is thought involved, but Expedition is really designed to be played swiftly and lightly. If you’re agonizing over every move, you’re probably hampering the game for everyone else because there’s not much to do when it’s not your turn. You can’t really plan too far ahead since the expeditions will change before your turn comes around again so if someone is sitting there stewing, it’s going to be a long night for everyone. The game does speed up with experience and lower player counts, though, so that 90 minutes is really the max and will go down over time. Punch your ticket to fun. There is also a little take that because a player can completely undo your move by removing an arrow or sending the expedition off on a new course. It’s not overly mean (unless the opponent is a jerk and laughs maniacally or does some kind of weird victory dance as they move), but it is there and sensitive people may not appreciate it. Fortunately, it evens out over the game because what’s done unto you on this turn can be done unto someone else on the next. There’s a bit less of this in two-player games because there aren’t as many people taking potshots at one another, so that may be the way to go if you want to play CareBear-style. 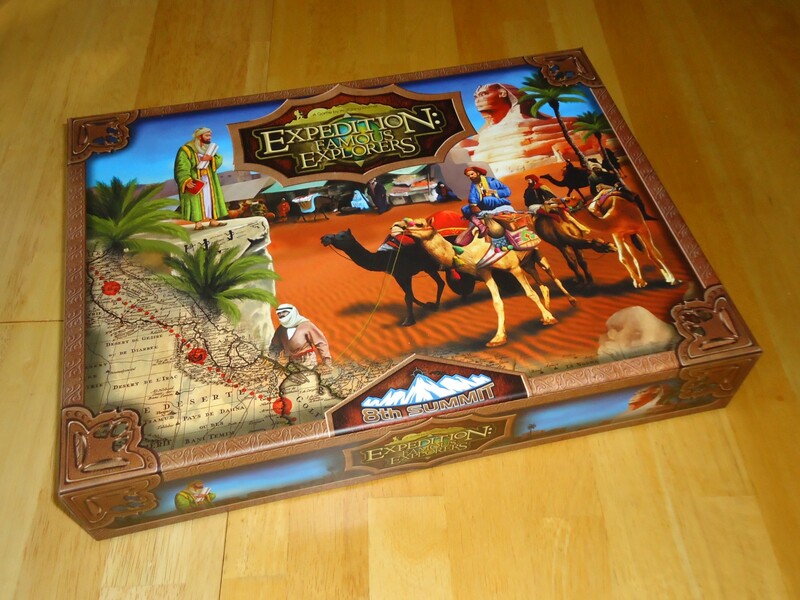 Speaking of two-player games, we find that Expedition is at it’s most strategic with two. With just two of you, you can do a little more planning since the board changes less between turns. There are, as noted above, also less people undoing your work. It’s also quicker. We knock off most games in under an hour. The components are excellent. The art is pretty, the box is super-sturdy and the cards are good quality. Personally, I find the board to be gorgeous but admit that it can be a bit busy to look at. There are a lot of dots and locations and it can be hard to find things your first few games. Fortunately, there are breadcrumbs on the cards and board in the form of color-coding and general location information that can help lead you to where you need to be, making this complaint less annoying than some on BGG make it out to be, in my opinion. Some of the Event cards used with the advanced rules. What all this adds up to is a game that’s fun and appealing. It’s easy to learn and play, making it ideal as a gateway game. The inoffensive theme and attractive art is appealing to mixed groups and non-gamers who don’t care about wizards or obscure economies. The fact that it plays up to six people makes it great for larger gatherings and family functions. It’s good for kids and adults so it should see a lot of playtime in most homes. Kids can play it on their own and the adults can join in without being bored or feeling like they have to throw the game so the kids can win. After the kids go to bed, the adults can bring out the advanced rules and play a more strategic and challenging game. 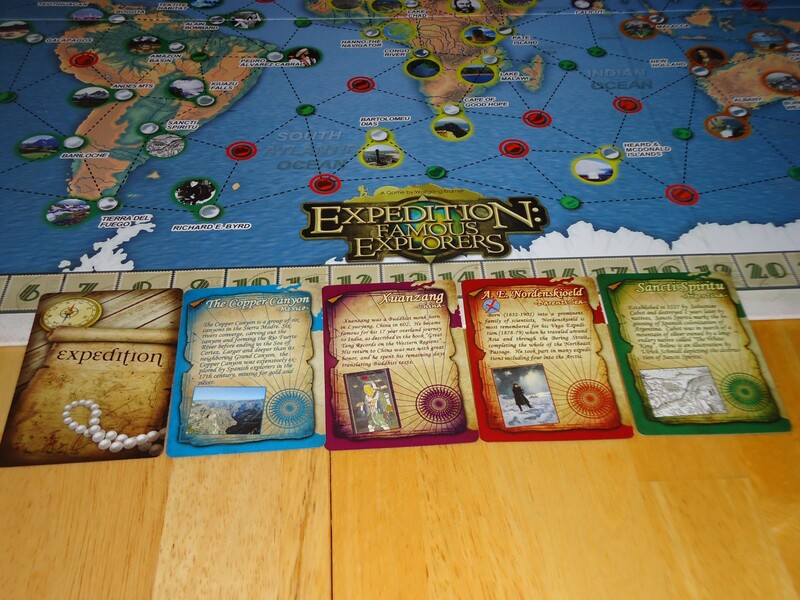 Expedition: Famous Explorers is everything a light, family-oriented game should be: Fun, slightly challenging, accommodating for different ages, groups, and skill levels, and appealing to a wide audience. If you frequently play in a family setting, or with non-gamers, or you just enjoy lightweight games, I don’t think you can go wrong with this one. Plays well from 2 - 6 making it good for varying group/family sizes. A game that younger kids can play with the adults and the adults won't be bored. Theme is inoffensive, family oriented, and easy for most people to like. Basic and advanced rulesets mean the game can accommodate different skill levels. Simple gameplay, yet some strategic thinking is required to do well. Inspires lots of good-natured table talk. Playtime can be a bit long for a family game. The board, while pretty, can be a bit busy for the eyes. A little bit of "take that" as the next player immediately undoes your move.